I've been all about itemized to-do lists lately (whether I ever get to cross off every item is another matter). Here's my suggested list for you this week. Action Item #1: Send a letter (or two) about e-fairness. Okay, folks, I've been remiss in not focusing on this before, but here it is. Amazon.com and other online retailers, surprising as it is, are not required to collect sales tax on items sold (or else it's not enforced). Obviously, this creates a bit of a disadvantage for brick-and-mortar stores -- especially those of us in states like New York, who have to add a hefty 8.625% on to every purchase. It's not like we're making more money -- we're just collecting it to pass along to the state -- but from a customer's perspective, they just have to pay more when they buy from a physical store than from an online store, which can disincline some folks to buy local. And that also means that online sales aren't supporting infrastructure, arts inititatives, and all the other state-funded stuff that local business must (and should) do. Sound weird and dumb to anyone else? Late last year, New York governor Elliot Spitzer (fresh from a career as an Untouchable-style Wall Street corruption cleaner-upper, and with a strong mandate to straighten out things in our state capital, Albany) declared that online retailers selling products in New York State would have to collect sales tax. Then he reversed the ruling. WTF?! So now, the American Booksellers Association, along with some other groups, is lobbying to get Spitzer and the state legislature to reinstate and enforce online sales tax collection -- a movement known as "e-fairness". The state budget (which potentially includes this new enforcement) is supposed to be approved by April 1, and there's a big lobbying effort scheduled for March 19 in Albany. In the meantime, the ABA is collecting letters from independent businesses supporting a new ruling. That's where you come in. If you're a bookseller or other independent business in New York State, you can send a letter to your assembly person and senator to let them know where you stand. Bookselling This Week has an article that will link you to a letter template and contact information for your elected representatives. I know, I know, it involves digging out your letterhead paper and using a stamp -- but it's a way to support your fellow indie businesses and keep them viable in the contemporary economy. Come on, folks -- it's a few minutes out of your work day, and it could make a difference for years to come. Just make sure to make it happen before the 19th, and then let Dave at the ABA know you've done it so he can add your letter to the fat stack of paper they'll be taking to Albany. Update/correction: Dave Grogan adds "One thing re: today's posting I did want to note ... Gov. Spitzer is on our side in this Internet Sales Tax issue -- the Internet Sales Tax provision in the proposed budget, in fact, is his proposal that we are rounding up support for. Action Item #2: Write about how you got started in bookselling. This is for the bookseller/bloggers in the room, as well as anyone who's been meaning to start that blog. At the ABA publisher forums this week, the inimitable Sarah Rettger clued me in to the Carnival of Independent Bookselling: a call for stories about how you got started in the biz, via Blog Carnival. I wrote up my story recently on the Bookshop Blog, but I'm definitely resubmitting to be part of the Carnival (look for it here later this week). I can vouch that it's a fun thing to think about, and a good reminder about why we're all doing this. Action Item #3: See an author interview on your lunchbreak. I've just this morning become a fan of titlepage.tv, a new website featuring long-form moderated author interviews. I've just started watching the first one, and even though I got to see Richard Price in real life at TitleWave, I'm totally enjoying Daniel Menaker drawing him out on his new book Lush Life, and can't wait to get to Charles Bock and Susan Choi. (I can vouch for Menaker's skills as interviewer -- he chatted with Gary Shteyngart last year as part of our Author/Editor series, which is very much the same engaging format as the Title Page interviews.) And how cool for those who don't often get a chance to hear authors speak! It's still a work in progress, and you can leave your comments, but I'm betting it's going to be worth checking out as often as a new episode is posted. Action Item #4: Stay tuned for big news. I learned some stuff at the ABA forums this week that I can't tell you about. But oh boy, is it cool. 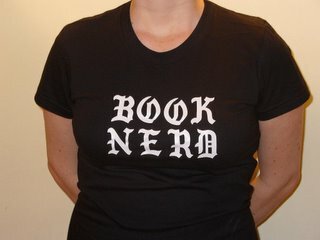 Get yourself psyched up for the big reveal at BEA -- it's going to rock.